Beckley Furnace has a close relationship with Housatonic Heritage, the umbrella organization that represents the Upper Housatonic Valley National Heritage Area. We’re proud to publish the Iron Heritage Trail map and brochure! It’s free, available at Beckley Furnace, at any area Historical Society, at most libraries, and at many hotels, inns, and restaurants in our area. We are also proud that Beckley Furnace is the centerpiece of this set of tours around our area. 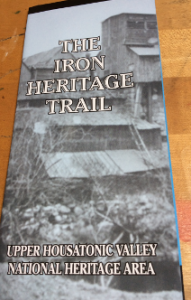 The Iron Heritage Trail makes it easy to see important elements of our industrial and social history via nine separate suggested tours. Each tour is a reasonable objective for a morning or afternoon, and each also provides opportunities for more study. Tour I: Beckley Furnace (that’s us!!). No driving in this tour; we believe there’s enough at Beckley to keep nearly anyone interested and involved for a couple of hours. Tour III: Beckley Furnace to North Canaan, Falls Village, and Amesville, CT. The brochure also includes convenient articles about the discovery of the so-called Salisbury Ore, the blast furnaces of the Salisbury Iron District, and the natural local resources that made the Upper Housatonic valley area a natural one for the production of iron.